AS IT STANDS: Who Is Bill Weld? Is He Crazy For Challenging Trump For 2020 GOP Ticket? Who Is Bill Weld? Is He Crazy For Challenging Trump For 2020 GOP Ticket? I have to admit that I was really surprised when a Republican - Bill Weld - announced he was running for president against The Donald. Frankly I thought most of the real Republicans had been driven into the hinterlands by Trump and his minions. The few that are still holding on in Congress are deaf mutes too cowardly to stand up to his assaults on the Constitution. Pundits think Weld is nuts for challenging the orange Cheeto in the Oval Office. After all, he has the backing of 90 percent of the Republican party according to the polls. The two-time governor of Massachusetts also ran as the vice presidential nominee on the Libertarian Party ticket in 2016. His conservative creds are considerable. Watching him being interviewed I was struck by how confident the man seemed. When reminded that Trump had a majority of Republicans behind him and did he know his chances were slim to none? His reply was, "Yeah. I do." Continuing, he pointed out that, "I have followers, particularly in New Hampshire, where I'm spending a lot of time. It's one vote at a time and one voter at a time, and you gotta meet 'em," he explained. To establish his anti-Trump crusade creds Weld described himself as a "Republican who works across the aisle and gets things done." That alone would be a novel approach, but Weld doubles down with it saying he would have a "bipartisan Cabinet" if he won the presidency. 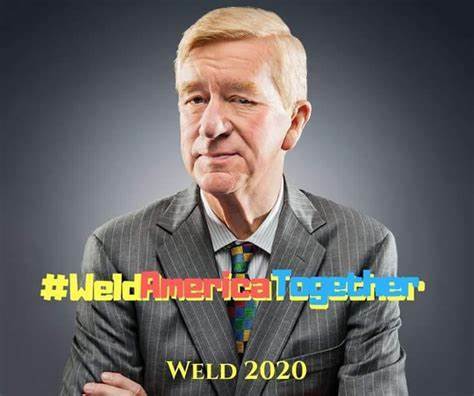 Weld is running as the sane alternative in the Republican Party. Who knows? He may have a large silent following who loath Trump but are afraid to openly defy him, who will show up when it comes time to vote. After the release of the real Mueller report tomorrow, all signs point to bad news for Donny on the obstruction of justice portion of the investigation. Then there's all the rest of the investigations Congress is conducting along with New York's investigation into campaign violations and Trump's financial dealings of possible fraud and cheating the IRS. That's a hell of a lot of baggage to carry for anyone - even Trump - that's running for the presidency. Bill Weld may very well be a sneaky candidate who picks up Republican voters feeling overwhelmed with Trump's crimes and assaults against the government. No. I don't think he's crazy for trying. More like crazy as a fox!